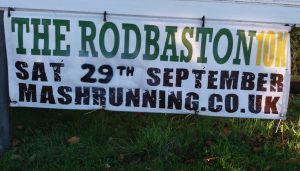 Dave Powner reports: Rodbaston is an Agricultural College and Equestrian Centre a few miles north of Wolverhampton. 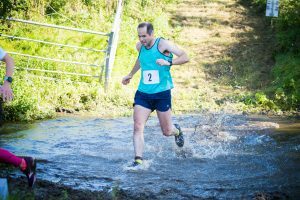 I did this race a couple of years ago, and knew to expect an XC style course, including flat but rugged terrain, water ditches, stiles, and even equestrian hurdles. Busses heading into the sticks were only one an hour, so I got an early one, and on arrival went for a walk further along the main road. During this time, the traffic built up and slowed down to walking pace. After half an hour of dawdling, I made my way into the grounds, and looked out for where to pick up my number and chip. I passed a field of young cows on my left, and sheep on the right. Then a sign saying “Silage Pit”, then “Lambing Shed”, and then “Registration”. There was a distinct lack of runners, and the first person I saw was Joe, who was the event’s chip timer, and was to be doing the same job for the Leafy 10k the next day. I told him about the slow traffic, and we discovered there was a problem on the M6, and the diversion was taking the traffic past Rodbaston. A decision was made to delay the start. So I collected my number, strapped on my chip, and went for a walk along some of the route. The grass underfoot was recently mown, but still long, and the cuttings cloaked the cracks, crevices and chasms left by the tractor tyres. Even walking along this route was difficult! I saved the jogging and dynamics until I was back in the car park by the start line. Over two hours after arriving at the venue, most of the 280 the competitors had arrived, so we were good to go! The first mile was tough on the ankles and knees, but I felt good. A couple of miles in, we got the first “feature”. There were two wooden equestrian jumps about 2 foot high, which I took with greater confidence than the competitors in front of me. Then a third that seemed to be optional, as the barrier tape allowed room to one side. Everyone I could see in front of me went around it, rather than over it, so fearing that they knew something that I didn’t, I circumnavigated it too. Immediately after that was the first water ditch. It was ankle deep, and about 5 paces long. Straight after that was a stile. This tough section seemed to affect those around me more than myself, and I made up a few places. There was a second set of three equestrian hurdles, the third being the hardest, at hip high, so I needed to use a hand for that one. The pattern continued of me picking up a couple of places after hurdle sections, and again after a second water ditch and stile. With no-one immediately ahead of me, a flock of sheep took the opportunity to quickly migrate from a neighbouring field, into the one we were currently running through. A sign that I needed to close the gap. The third water ditch was a by far the toughest. There was a dilapidated bridge that had been taped off, and so we had to cross through the stream. That first foot down on landing was quite a shock! The surface of the water was 18 inches down, and it was at least knee deep!. Straight out the other side of the ditch, the terrain was heavily rutted, and hard to predict due to the length of the grass. Every tenth step felt like a potential ankle breaker or knee dislocator. This was the first point in the race that I felt weakened, and I dropped a place, but I clung on to the guy who passed me. I regained my composure in time to step it up for the last kilometre, and being along gravel track and tarmac it came as a welcome relief, and I picked up one place on the way. On the slight downhill to the finish line I saw the opportunity to recreate another bit of XC practice, and pick off one more place if I put on a sprint finish. I just pipped that opponent to the post, but I didn’t quite catch the guy who overtook me after the ditch. I was very pleased with my placing in the results, higher up and quite a bit quicker than my previous visit here despite the course being a tad longer. 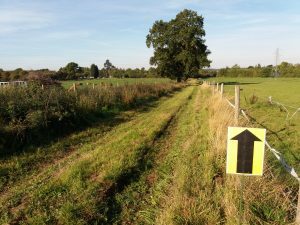 Mash Running put on great events for those of you who love challenging terrain, and are not bothered by them being licensed and on RunBritain. There was a lovely finishers medal, and a sparse goody bag with two “fun size” snacks. I missed the can of Erdinger that we were meant to pick up. The weather was lovely, so I hung around until the last finisher came in, and then took a long walk home along the canal. 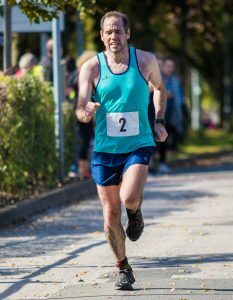 This entry was posted in 10k, Race Reports, Trail by BvH Admin. Bookmark the permalink.